Low profile bases with stacking slots reduce storage space need. 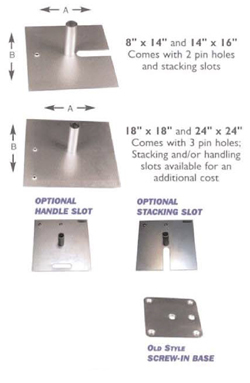 Extra pin holes can be drilled to your specifications for an additional cost. 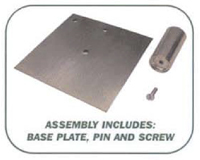 All steel base plates are zinc plated for rust protection and long life. B814 8" 14" 3/16" 6 lbs 3' 1.5"
B1416 14" 16" 3/16" 12 lbs 8' 1.5"
B1818 18" 18" 3/16" 17.5 lbs Up to 12' 2" x 4"
B181838 18" 18" 3/8" 35 lbs Up to 16' 2" x 6"
B2424 24" 24" 3/16" 31 lbs Up to 20' 2" x 8"
B242438 24" 24" 3/8" 62 lbs Up to 24' 2" x 8"
All ADJUSTABLE UPRIGHTS use 2" diameter pins.